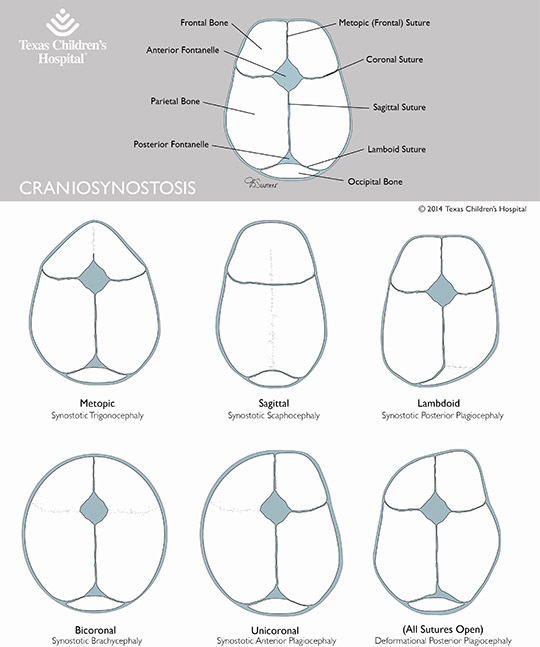 Diagrams of infant skull with types of craniosynostosis. I am co-director of the Craniofacial Surgery program at Texas Children's Hospital. We focus on care of children with craniosynostosis. Care is individualized for each child's condition, and age at the time of evaluation. There is no one-size-fits-all approach. We all want the best for our children; I strive to help parents make the right choices for their children. We are in the journey together. Thoughtful and skilled surgeons are a must. We handle all craniosynostosis evaluations together in a team-based approach. In the minority of cases associated with genetic syndromes, it is imperative to have coordinated care with multiple subspecialties. With this in mind, we designed multidisciplinary craniosynostosis clinic to be planned around each patient's needs. Read what one courageous mom has to share about her baby's and her family's experience. We arm families with information. ​I aim to make the process better for every child and family. Our program also supports a lot of formal quality improvement work. Download the pdf for endoscopic surgery here. Download the pdf for open sagittal synostosis surgery here. Download the pdf for frontal orbital advancement surgery here. Download the pdf for information about posterior cranial vault distraction here. 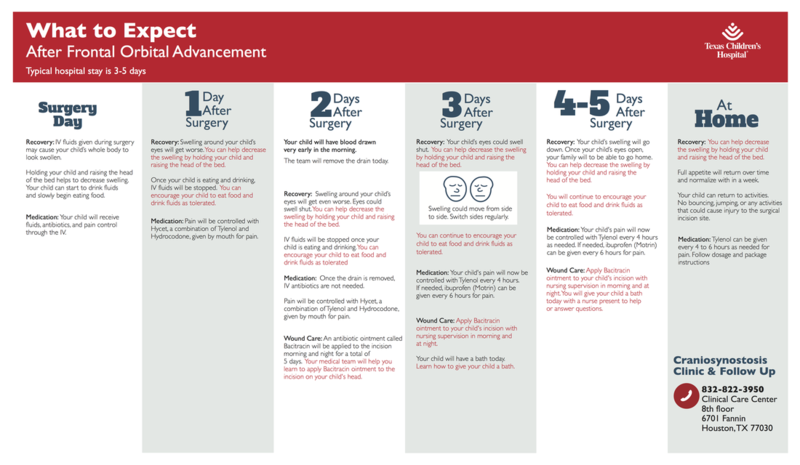 Download the pdf for posterior vault distraction daily checklist here. We recently met with Erica Mossholder, the Executive Director of the Children's Craniofacial Association. Check out the CCA website the terrific work our non-profit partner is doing to empower children and families of kids with craniofacial differences. I love the #ChooseKind movement, inspired by the child and the story in the book Wonder by R.J. Palacio. The awesome moms of our Family Advisory Board run a closed online forum to help other parents. On Facebook, search for "Houston Cranio Families" and request to join. 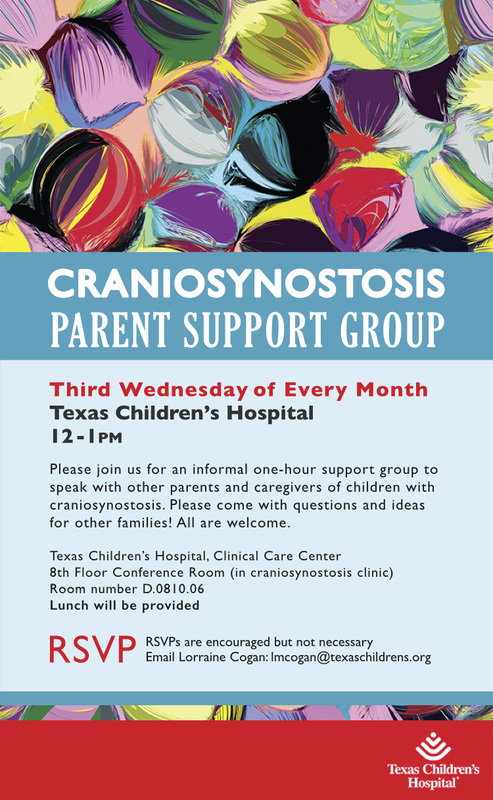 A monthly parent support group is held at Texas Children's Hospital. Learn more. Care packages from this inspiring charitable organization run by 2 moms are delivered to our patients undergoing surgery. Learn more. 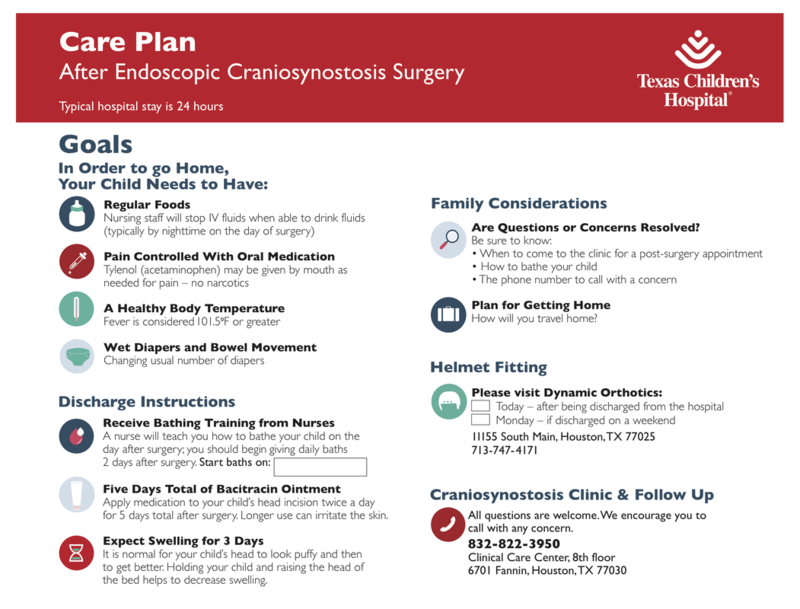 James Brookshier CPO LPO has over 10 years of experience with custom cranial orthoses (helmets) -- he recently worked with and transitioned the Houston helmet practice to Lisa Abernathy CPO. Their helmet facility ranks #1 in patient volume internationally. Children come from all over the world to Houston to be treated with custom individualized care. For my patients with helmets, I trust our helmet orthotics colleagues to take as much care with the helmet process after endoscopic surgeries as we do in surgeries themselves. Partnership with a meticulous, thoughtful, and experienced orthotist is instrumental to great outcomes. For families who are going through the helmet process, click here to view helmet pattern choices. Our team for plagiocephaly evaluation was established by Dr. Thomas Luerssen, seeing close to 1000 babies a year, The head shape clinic starts with distinguishing between positional plagiocephaly and craniosynostosis. We give pediatricians and families with the peace of mind to make the correct diagnosis, and help families through the treatment process. STAR scans (2D laser surface tracings) are used to objectively track improvement without any radiation exposure. Little Kinley was attacked by grandpa's dog, leaving her with a serious brain injury and complex skull defects. It has been an incredible journey with Kinley and her family. Her parents share their story of hope and recovery on ABC news [Toddler goes home after year-long recovery from dog attack]. They have come so far since the initial dog attack; her father shared the story with ABC news the year prior [Dog viciously attacks baby girl from Houston].